Nepal is a country of multicultural, multi-religious, multi-lingual, pluralistic and mosaic society. Ethnic communities have their own distinct healing practices. It has been widely felt that access to modern medication in the rural as well as in urban community is very low; despite the service, outlets have been made available even at periphery level by the government. Health Care practices – Modern, Traditional, Self-medication, Alternative exist in almost each and every community, are the indispensable part of our health system. Merely establishment of Sub-Health Post, training for Health Workers cannot ensure the access to health service, also requires an attempt on the Socio-economic assessment, cultural and behavioral diagnosis. 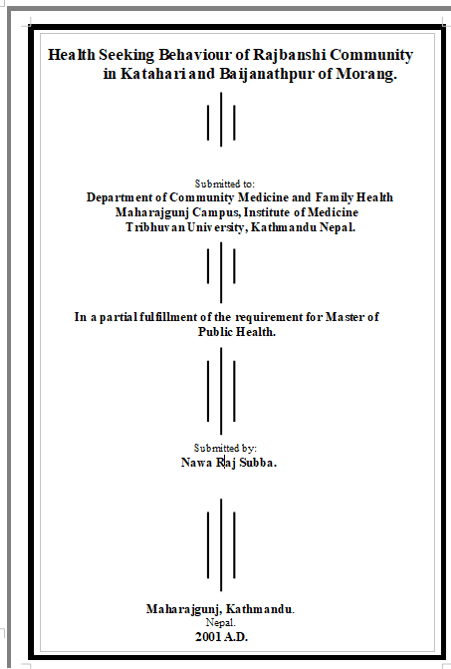 This study was undertaken in two Village Development Committees (VDC) of Morang district with the Specific objectives of: (1) to find out the practices of using traditional and modern medicine in the community. (2) Assess the satisfaction and dissatisfaction with traditional medicine and modern medicine or health services available. (3) Assess the expenses on health care. (4) Know various methods of self- care and types of therapies used by consumers. Attempts to 175 households’ visits were made particularly head of the households as respondents of the study. A Rajbanshi graduate and one more interviewer were trained prior to go to the community. With the help of these two-trained interviewers, the researcher had carried out interviews and conducted Focus Group Discussions. ४८ किन बन्ने किन बनाउने डाक्टर ?